Craft. Think about that term in relation to furniture makers and you conjure up a small workshop with myriad tools; each with their own unique purpose. Each wielded by an artisan who has dedicated many years to mastering the intricate details that go into making his final product a work of art. The craft of the bartender is no different. 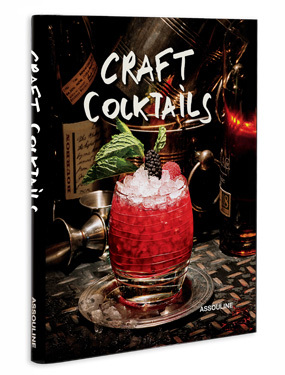 And nothing illustrates this more beautifully than Brian Van Flandern’s second cocktail book which includes 50 of his own recipes plus 20 from the likes of Jim Meehan, James Menite, Eryn Reece, Julie Reiner, Dushan Zaric and other professionals from Clover Club, Death & Co., Employees Only, and PDT – the stunningly photographed Craft Cocktails. To be able to take a classic like the Long Island Iced Tea, which may not be respected by serious bartenders but certainly is on the lips of thousands of guests daily and turn it into something that is well balanced? That is craft. To achieve the perfect hue of your corporate partner’s signature packaging (see the Tiffany & Co. Cocktail on page 105)? That is craft. If the next book is going to be as gorgeous as this one, and offers up drinks shot in memorable settings and presented in elegant bar ware like the Baccarat, Rosenthal Versace and Lalique crystal glassware used here to cradle these concoctions, we’ll be busy crafting our own cocktails while we are patiently waiting for the Craft Cocktails follow up.